Hettie “Maxine” Bangert was born in Omaha, Nebr., on Oct. 2, 1922, to Chester and Della Smith. 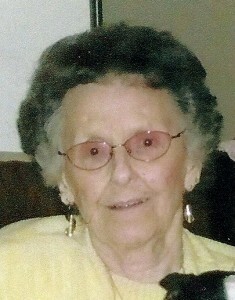 She passed away at Country Meadows of Sedro-Woolley on June 30, 2010, at 87 years of age. Maxine was preceded in death by her loving husband, Bob, of 65 years, whom she talked about daily. She is survived by her son, Robert “Rob” Bangert, and her daughter–in-law, Cathy, of Oak Harbor, Wash.; her daughter, Pam Hoffman, and son-in-law, Bill, of Monroe, Wash.; her grandkids Dan Hoffman and his wife, Nichole, of Marysville, Wash., Jolene Hoffman of Monroe, Wash., Herbert Bangert and his wife, Suzzi, of South Carolina; and great-grandchildren Mattheu, Christopher, and “Baby Hoff” to be born on Dec. 30. Maxine and Bob were married in Grand Island, Nebr., on May 6, 1945, and moved to Washington State in 1946 to make their home in Rockport for 54 years. They moved to Country Meadows in Sedro-Woolley in October 2000. Bob passed away in 2001 and Maxine continued to live at Country Meadows where she was a friend to all. Maxine was a very kind, loving and special friend, mother and grandmother. She will be greatly missed by her family and all who knew her. Maxine had a great love for Pug dogs as anyone would tell you, as her apartment was decorated with them everywhere. The family would like to express their deepest gratitude and thanks to Country Meadows, where Maxine was a resident for 10 years and who took such great care of her when it was needed. The family would also like to thank Hospice of Skagit County for their wonderful care and compassion. Memorials in Maxine’s name are suggested to Hospice of Skagit County, 819 South 13th St., Mount Vernon, WA 98273. Graveside Services will be Sat., July 10, at 2 p.m., at the Forest Park Cemetery in Concrete. Arrangements and Services under the care of Lemley Chapel, Sedro-Woolley. Please share your memories of Maxine and sign the online guestbook at www.lemleychapel.com. It’s only for awhile that we must part. And then, when you must come this way alone.